Asus expects its Turbo GPU to be a strong product due to Nvidia ditching its traditional single-fan cooler design. 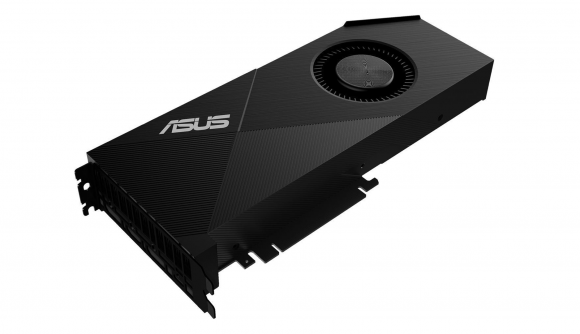 Despite the Asus Turbo’s price of $1,210, a touch higher than that of the factory overclocked Nvidia Founder’s Edition, Asus expects sales of its totally stock-frequency blower-style card “to go up” once the RTX 2080 Ti, 2080, and 2070 launch. While traditionally Nvidia would opt for a blower-style cooling solution – that is, one that features a single radial fan and expels air out the I/O plate – this time around, the Founder’s Edition cards all feature dual-fan, open-air designs. That leaves blower-style cards up to AIBs. Usually, these cards represent the cheaper option compared to some of the hefty heatsink designs that cost a pretty-penny, but there are always going to be times when a blower card is just better suited to the build at hand, such as inside small form factor builds. That’s why Asus expects sales of its radial blower-equipped card, the Asus Turbo, to increase once the next generation launches later this year. At Asus’ incredibly noisy Gamescom 2018 booth, a company representative informed me that the RTX 2080 Ti Turbo graphics card “should be a really hot sell this year”. The card itself is a tweaked version of the Pascal Turbo currently on the market. Asus has increased the fan size to 80mm, improved its dust resilience with an IP5X rating, and shaped the shroud to increase airflow. The shroud now comes with a cutout just beneath the GeForce logo that allows more air to move through that singular fan when potentially blocked in small form-factor case or by another card as part of a multi-GPU setup. Maybe that’s Asus throwing caution to the wind, but that’s at least one card the company has designed specifically with SLI entwined multi-GPU rigs in mind – a setup very few gamers went in for with the Pascal generation. Even with NVLink, limited to only the top-end RTX 2080 and RTX 2080 Ti, I’m still not convinced too many people will want to splash out $2000+ for dual GPUs- but maybe there’s a chance of SLI returning to the fore if a secondary card’s potential can be unlocked via the high-bandwidth NVLink connection. But despite its stock-frequency and blower-style cooler, which usually represent the cheapest option available to gamers, the $1,210 Asus Turbo is 11 bucks more than Nvidia’s own factory overclocked Founder’s Edition. That means that the mostly sub-optimal, occasionally useful, blower-style chiller, at stock speeds, will actually come at a premium over the faster ‘reference’ design. Let’s hope there’s an AIB out there looking past Nvidia’s Founder’s Edition to that, already, long-forgotten $999 MSRP.